Beginning in Smap version 14.03 you can add forwarding to a survey template. This will result in each submitted result being forwarded on to the target server. One way of using this forwarding feature is to install Smap on a laptop. This laptop can be used to aggregate and analyse data collected on mobile phones in areas that do not have a reliable Internet connection. You can upload the results from the phones to the local laptop over a wi-fi hotspot. Once you connect the laptop to the Internet it can forward the results onto a cloud server so that they can be worked on by a distributed team. Community laptops are an extension of the “offline laptop” concept. Each community can maintain its local view of data collected on the phones. However they can set up a forward link so that a consolidated view of all the data from all the communities can be aggregated. The following video shows the forwarding of results from a Smap Server to an ODK Aggreate server. Create the same survey template on the local and remote server. These templates can have different names on each server but should be the same template. A good way to do this is to download the template as an XML file from one of the servers and then upload it to the other. Enter a user ID and password. You should use a user id that only has privileges to complete surveys (enum) as the password is stored in the database. So don’t use your Admin user id! You can monitor forwarded results on the monitor page by selecting the “forward” radio button. 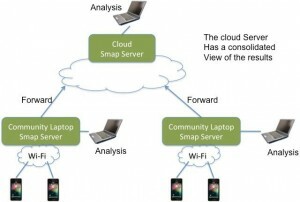 This entry was posted in Uncategorized and tagged assessments, cloud, evaluation tools, fieldTask, ODK Aggregate, Smap Consulting, survey on April 19, 2014 by Neil Penman.